Saturday’s Ratha Yatra Parade of Chariots Festival was greeted with enthusiasm and togetherness. The Ratha Yatra Parade of Chariots Festival, held Saturday on the Ben Franklin Parkway, featured a giant parade and feast. 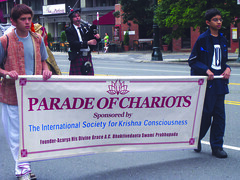 Participants in the Parade of Chariots Festival of India endured cloudy skies above, as religious chants, brightly colored chariots and enthusiastic attendees were seen and heard all the way down the Ben Franklin Parkway to the Philadelphia Art Museum on Saturday, Sept. 12. This year’s “Feed Your Soul” slogan, which was used to advertise for this event, summed up the parade’s meaning for both its participants and its coordinators. Women dressed in sari and salwar clothing and men in sherwani and dhoti clothing gathered to play cultural transcendental music, sing religious chants and mantras and enjoy a delicious vegetarian feast. Chariots of red, orange and yellow dangled with flowers and beads as they made their way to Eakin’s Oval in front of the art museum, where vendors and performers set up to entertain visitors. From the very first Ratha Yatra, dating back 5,000 years ago in India, gatherers have had the opportunity to spread various messages and cultural traditions to those willing to respect and open their minds to it. “This annual festival is held to give us all an opportunity to reconnect in an attitude of service and love,” Committee Chairman Vishnugada Dasa said. Platforms held musical performances, classical Indian dances, drama, philosophical discussions and explanations of vegetarianism. Vendors, such as palm readers and those who sold Indian clothing and jewelry, provided a welcoming cultural environment for a fun-filled day. “I was surprised and also appreciative of the fact that various non-Indians, in addition to the followers, were present and taking full part in the parade,” said junior biochemistry major Arpan Patel. Patel attended the festival in hopes of celebrating with members of his own cultural background. Those intrigued most by the celebrations seemed to be those who attended the event with no personal relation to the cultural background, like Janelle Ince, a senior accounting major. The festival served as a great reminder of how cultural diversity is exhibited, celebrated and embraced throughout the city of Philadelphia. Monica Sellecchia can be reached at monica@temple.edu. Summer Beckley goes to church to find out why the rest of Philadelphia is missing out on this gem.